Preheat oven to 160°C. Place the butter and sugar in the bowl of an electric mixer and beat for 8-10 minutes or until light and creamy. Add the eggs and beat well. Sift the flour and cocoa over the mixture, add the chocolate and beat until just combined, scraping the sides of the bowl. 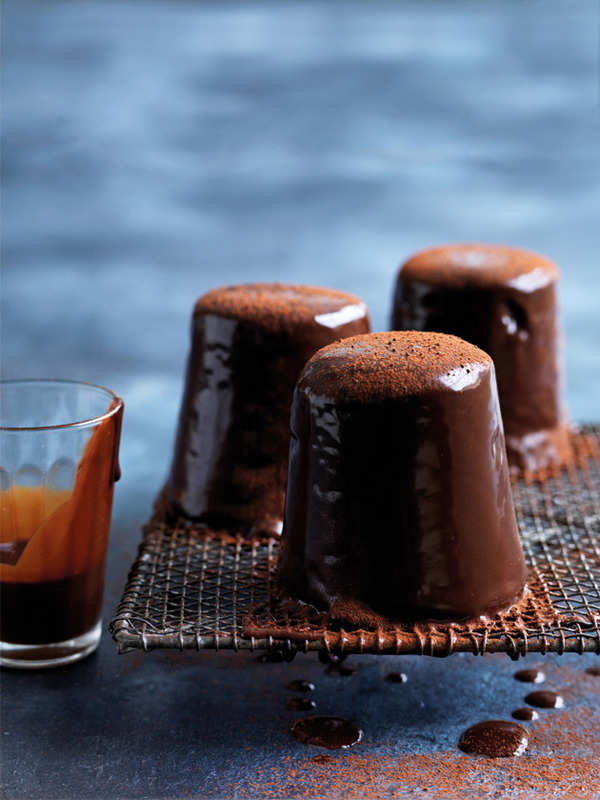 Divide the mixture between 10 x lightly greased 2/3 cup-capacity ramekins and place on a baking tray. Bake for 25 minutes or until cooked when tested with a skewer. Turn out onto a wire rack to cool. Meanwhile, make the glaze. Place the cream into a small saucepan over medium heat and bring almost to the boil. Place the chocolate in a bowl, pour the cream and hot coffee over the chocolate, set aside for 2 minutes and then stir until smooth. Set aside for 30 minutes to cool and thicken. Place the cakes on a wire rack and pour over the glaze. Set aside for 10 minutes to set, then dust with cocoa powder. Makes 10.